The transformed behavior of consumers in different global metro cities serves as one of the primary factors in reinforcing the need for making taxi-booking seamless. Conversely, for taxi businesses in smaller cities where still people wave or whistle for taxis do have an opportunity to increase their business profits by getting an Uber-like taxi-booking app developed from a reputed company. Indeed, there happens to be a personal connection between local taxi business owners and the local populace compared to the new entrants like Uber. It definitely offers them an added advantage for converting these semi-loyal connections into permanent assets if they think to develop their own, branded, customized taxi-booking mobile app. Let us assume you own or manage a fleet of taxis and fully convinced about the benefits of investing in taxi-booking mobile app development. What next? 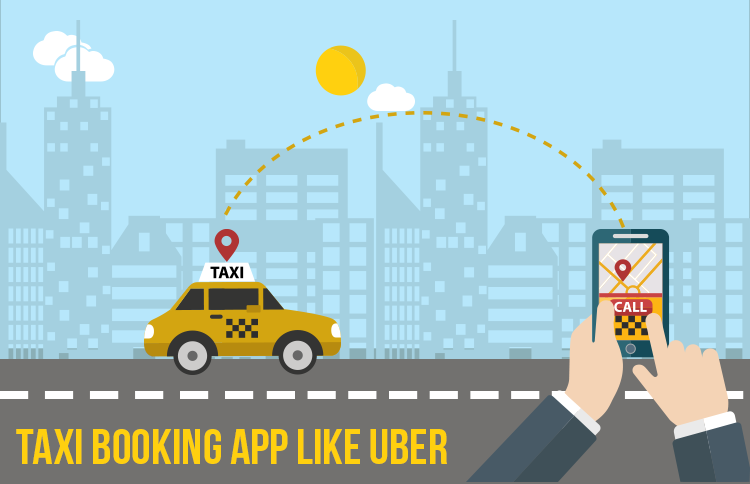 Speak about any relevant taxi-booking solution and you will realize that such solutions typically consists of a mobile app developed mostly for Android and iOS platforms. The app has two major interfaces, one for drivers and one for passengers. Apart from that, you will also need a taxicab management panel. Depending on the number and types of taxis in your fleet, you can decide later if you need a website and a call Centre based dispatching system or not. Then the major worry strategic structuring of fare, pricing, and payment options. To design the pricing structure, it is necessary to understand the compatible rates in your area and you should be aware of what your competition is charging. Finally, you will need to guide the mobile app development company for customizing the app in such a way that it precisely meets your exact business requirements. Before you start with an idea to develop a taxi-booking mobile solution, let us briefly look at how Uber works. First, you let the app know that you want a ride, and then the app identifies your location. Having understood where you are and where you want to go, the app finds a nearby cab and intimates the driver about the availability of passenger. You receive the details of the cab and driver along with its location and within the prescribed time, the driver comes to pick you up. After reaching the desired destination, the app asks you to rate the ride and the driver after which invoice generation takes place. You have options to pay either in cash through a mobile wallet or using your debit or credit card. Now, the question is how we shall empower the mobile app to perform all these duties. Right from the start, founders of Uber Garrette Camp and Travis Kalanick called Uber a location-based startup. Before ideating their business strategy, they devoted their time and efforts to understand the specifics and features of geolocation in the Android and iOS operating system. Back in 2010, it was a dreadful effort to decode the location specifics in Android and iOS. On the contrary, we are lucky as we can easily fetch custom-made geolocation API for both Android and iOS. Identifying the Location through Device: Whether it is a passenger or driver, both needs mobile devices to run the app. If they are using the app on their own devices, finding precise locations of both using CoreLocation Framework is an easy task. Using classes and protocols provided by the CoreLocation Framework, the mobile apps are indued to configure and schedule location as well as send all location related events to the server. Whilst, using the same framework the app is empowered to define geographic regions and monitor the movements of the user. Google’s very own Location API is preferred for developing location-based Android mobile apps. It is capable enough to meet versatile app development needs required for implementing location-based features while intelligently managing the underlying technology. Offering Driving Directions to the Driver: For leading the driver to the exact location, the app has to show point-to-point directions to the driver on a map. MapKit is the preferred technology used to achieve this in iOS app development. By registering the app as a routing map, making directions available to the maps app and all other mapping software on the user’s device becomes possible. On the contrary, Google Maps Android API empowers the development of location-based android apps for accessing directions and routes on a map. Notifications play an important role in a taxi-booking app. It is mandatory to send a couple of notifications to users and drivers to initiate the next action. For instance, after booking a cab user receive a notification after the driver accepts a request and the second notification updates user about the arrival of the cab within a minute. In addition to that, a notification to driver alerts him about the ride request from a nearby location. In the event of cancellation of the ride, both users and drivers receive an update through a push notification. It is up to the user to select the preference of receiving updates either through push notifications or through SMS. To integrate push notifications and SMS in the app usually a third party telecommunication provider’s support is necessary. On the contrary, Apple Push Notifications Service is used in iOS app development and Google Cloud Messaging Service (GCM) is used to provide push notifications for the Android app. Although Uber has recently integrated a cashless payment method, not many taxi-booking apps prefer it. There has to be human-to-human cash transfer including tips when you are riding in a cab. However, if a particular taxi business needs to integrate debit and credit card payments it is not a prominent task to accomplish. Just remember there are few requirements the taxi-booking company needs to comply with – like in the USA there are PCI requirements. In addition to that, compliance with the Payment Card Industry Data Security Standards (PCI DSS) is necessary wherein a company processing, storing or transmitting credit card information ensures maintenance of a secure environment. Braintree – the leader in the mobile payment market is, in fact, a beneficial choice to empower mobile apps for accepting card payments. Apart from that, Stripe is also one of the outstanding options to receive card payments. PayPal’s mobile SDK Card.io has a nice record of accomplishments for credit card scanning on iOS. Card.io offers a unique way of inputting your card information, just hold the card in front of the mobile camera and you are done. The app sees reads and enters the card information for you. On the contrary, you are expected to manually input the information and link your credit card data to your account in the Android App. Apple Pay and Google Wallet can be options if preferred by the business owners. Although an app like Uber is divided into apps for users, drivers and an admin panel the development cost are usually dependent on the design, native app development, back-end development, web app development, project management, and quality assurance. Read our blog “A tentative Cost for Developing On-Demand Taxi App like Uber” to understand how much it will cost to develop an app like Uber. What to Expect from a Customized App like Uber? For any taxi-booking app development of a robust web app admin panel, is a must. This is actually the medium using which you can control your online taxi-booking business by reviewing, managing and storing all the in-app activity. The admin panel offers you a quick view of all the associated processes happening on road between passengers and drivers. Using the web app you can suggest the best navigation route for the ride, you can manage payroll and revenue and you can collect data from your clientele for further enhancement. Are you interested in developing a location-based app like Uber? We are here to help you with our realization about the stiff competition prevailing in the online taxi-booking ecosystem. We will let you know if an app like Uber is sufficient for your business to give a stiff competition to the existing players or you need an advanced, innovative Uber clone. We have already built similar mobile apps like Hire4Drive, Cabwala, Miller & Triio (Carpooling & Ridesharing App), N E Place (Custom Car Rental) and StearClear USA (The app that gets your car home when you are too drunk). Sphinx team would be glad to provide you with a fare project estimate depending on the scope and specifications of the app. Contact us to drop a line and receive a detailed product development roadmap.